China Airlines is to return a diving camera found by one of its workers on a Taiwan beach to its rightful owner who lost it more than 6,000 miles away across the Pacific Ocean in Hawaii. The Taiwanese company is offering Lindsay Crumbley Scallan, from Georgia in the USA, a free return ticket to fly to Taiwan and collect her waterproof Canon camera. If she takes them up on the offer, Ms Scallan will also be able to retrieve the photos she took on her 2007 diving trip to Maui in Hawaii as the memory card is intact inside the camera. 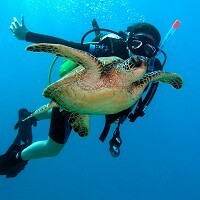 She is lucky to get the images back as although scuba diving travel insurance might replace a lost camera, it cannot replace the memories that are on it. The camera was found covered in barnacles by China Airlines manager Douglas Cheng while he was walking along Taitung beach on the east coast of Taiwan last month. He managed to open the photo files on the memory card to discover its origin. The media learned of the story when China Airlines staff at Hawaii's Honolulu airport began a search for the owner of the camera and a friend of Ms Scallan told her on Monday that her camera had been found.